The theme in this week’s blog posts has been partisanship – lingering disputes that are re-emerging in Wisconsin, Minnesota and Nebraska. Reading those posts (and in the wake of the news over the last few weeks from Washington, DC) might lead one to think that legislators are staking out self-serving positions on election policy in order to gain the upper hand in the political process. Republicans and Democrats have sharply different priorities when it comes to elections. By 54%-43%, a majority of Republicans say it’s more important to make sure no one commits voter fraud and harms the rights of legitimate voters. 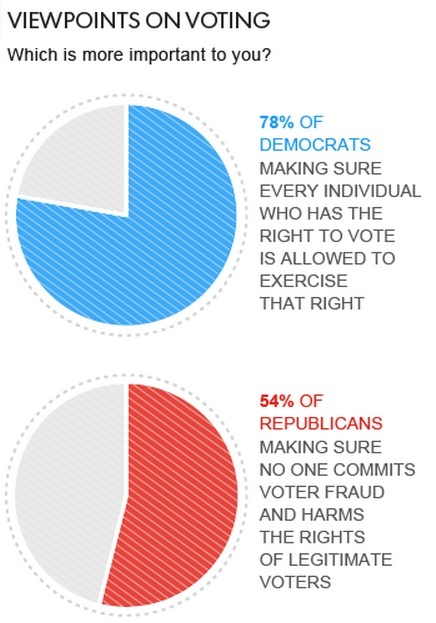 By 78%-20%, Democrats say it’s more important to make sure every individual who has the right to vote is allowed to exercise that right. In other words, the two major parties have very different approaches to election policy – approaches that are reflected in the views of people who identify with each of those parties. We shouldn’t, therefore be surprised that elected officials don’t always see eye to eye either. While that doesn’t excuse continued gridlock on election policy, it does at least suggest that the parties aren’t just thinking about themselves when it comes to election changes. Navigating that divide is the constant challenge of election officials nationwide. Be the first to comment on "It’s Not Just Legislators: New Poll Shows Voters Divided on Election Policy, Too"